﻿﻿﻿How to get your feet wet in the latest paddling craze. ﻿﻿﻿﻿﻿﻿﻿﻿﻿Were you the one always being told to sit down when in a canoe? Does “Don’t rock the boat!” sound familiar? Here’s your chance to paddle standing up, and no one will fuss about it. 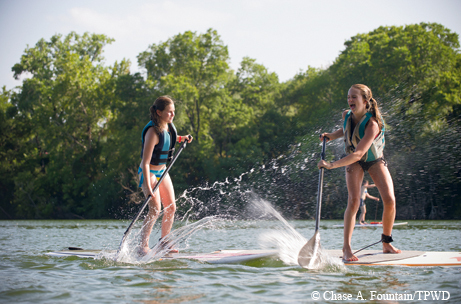 Stand-up paddleboarding (SUP) is the fastest-growing segment of paddling sports. It is a great way to have fun on the water, enjoy the great outdoors and get some exercise. SUP is an excellent whole-body workout. Many athletes now use it to cross-train — it’s an outstanding core workout and improves balance. Yoga enthusiasts have found that they can do the downward-facing dog position on a paddleboard, so classes are now taking place on the water. SUP offers everything from a calm and relaxing experience to extreme whitewater thrills or surfing on the coast. To get started, all you need is a board, a paddle and a personal flotation device. The boards come in a variety of shapes and sizes. Some resemble a floating sidewalk. There are short surfing models and long, narrow racing models. So how do you know which board is best for you? Beginners should choose a wider, thicker board that offers more stability, at least 30 inches wide and 11 feet, 6 inches long. Smaller, less stable boards will frustrate beginners. Stand-up paddling uses a long, T-grip canoe paddle. The paddles come in a variety of shapes and sizes, but all have a canted blade. There’s an elbow between the shaft and blade, and paddlers are supposed to hold the paddle with the bend in the blade toward the front of the board. This bend serves two purposes: It gives you a longer reach as you stroke and minimizes water pickup when you lift the paddle out of the water. This reduces fatigue and helps you maintain your balance. Select a paddle that is 6 to 10 inches taller than your height for comfort and efficiency. If your paddle is too short, you won’t be able to reach the water easily. If it’s too long, the paddle will be difficult to lift out of the water between strokes. You must have a life jacket while paddleboarding. Choose a Type III, paddling-specific life jacket, designed to be cool and to allow good range of motion. Find a friend and give SUP a try. The American Canoe Association, www.americancanoe.org, offers more information and can help you locate qualified instructors in your area.